Diablo 3's 2.4.0 patch is expected to roll out before the end of the year, and with it will come a whole new zone for Adventure Mode. 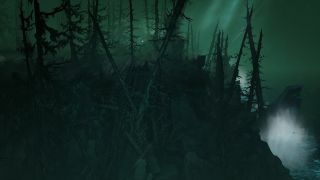 Dubbed Greyhollow Island, the video above is the first time Blizzard has shown the zone in motion, and while the footage is brief, it does contain some of the hellish enemies you'll encounter. It doesn't look like the kind of island you'd visit for a holiday, especially as it's "devoid of civilized life". Or maybe that's exactly why you'd visit! With an environment inspired by the Pacific North-West (though much grimmer than that region, you'd hope), Blizzard has published a bunch of notes over here for anyone eager to dive into the nitty-gritty of its development. Of chief interest is how the studio is weaving story into a mode traditionally devoid of plot. "Grasping the story of Greyhollow is a more complex endeavor than a jaunt through the zone," the blog reads. "As you explore the island, you’ll begin to unravel the mystery that’s threaded through each journal entry and event you stumble upon. Not every player will experience the story in quite the same way and may not even draw the same conclusions as a result; it’s truly the choice of each adventurer how much they want to focus on what’s unfolding or just blitz through and check a bounty off their list." Still no word on when Patch 2.4.0 will roll out, but I predict "soon". It'll also include new Set Dungeons (non randomised dungeons featuring specific sets of gear) and a whole lot more.